Twinkling lights add a bit of magic to the holiday season. Infants to elderly are fascinated by dazzling lights displays. 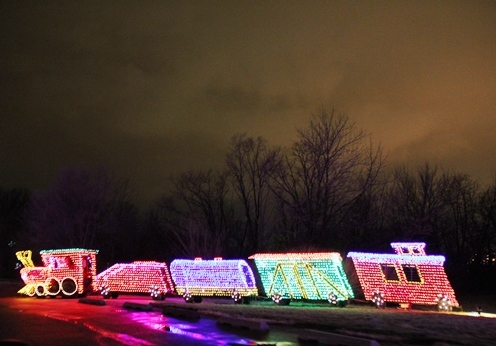 Whether you prefer to enjoy holiday lights on foot, in the warm comfort of your car, or even from a helicopter, you’ll find many impressive and unique holiday lights displays throughout Illinois. Editor’s note: This article has been updated for 2018. 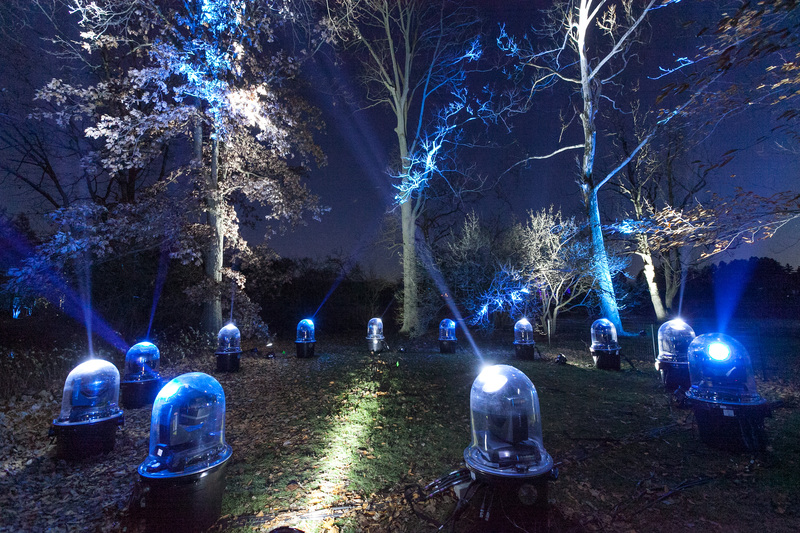 At Morton Arboretum’s Illumination, hug a tree and it changes color. Stand in front of the camera and your face projects high onto the trees. With a wave of your hand you create the illusion of rain or snow. Sing to a tree and watch the colors change. Take a mile-long stroll through this interactive virtual kaleidoscope of color. Through January 1. Note: Tickets are available for specific times, beginning at 4:30 p.m. Once admitted, you can stay as long as you’d like. Admission ends at 8:30 p.m., and the exhibition closes at 9:30 p.m.
Lincoln Park Zoo Lights twinkle on the following evenings from 4:30 p.m. to 9 p.m.: November 23, 24, 25, 30; December 1,2, 7-23, 26-31 (closes at 8 p.m. on the 31st); January 1-6, 2012. Enjoy musical light shows; more than 100 giant themed displays; live ice sculpture carving (Fridays through Mondays); Strolling carolers (Mondays through Thursdays); warm spice wine, more. 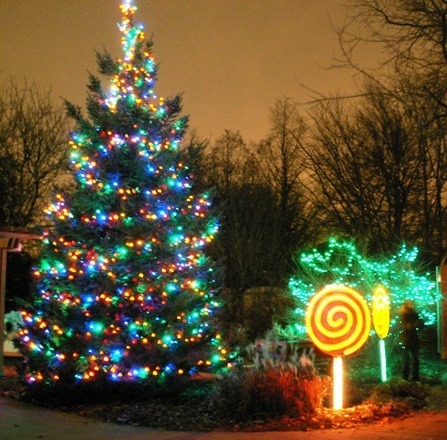 Brookfield Zoo Holiday Magic runs Saturdays and Sundays, December 1-2, 8-9, 15-16, 22-23 plus Wednesday through Monday, December 26-31. Enjoy over a million lights, ice carving, the Holly Jollly Theater, a skating rink, and lots of entertainment. 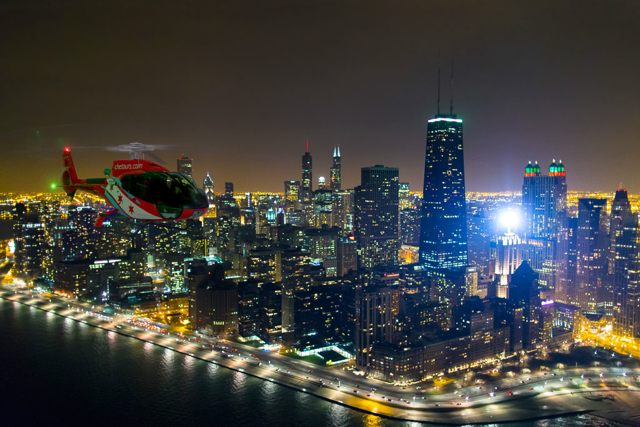 On the Chicago Helicopter Experience Holiday Lights Tour, view the dazzling lights of Chicago from the air, including Michigan Avenue, Lincoln Park Zoo Lights, and Millennium Park. From the moment you lift off the ground, all the way through your half-hour ride, the lights will spread before you. Book your tour in advance. If you miss East Peoria’s lighted parade, not to worry. The floats that were in the parade are part of the Folepi’s Winter Wonderland. Instead of the floats riding past you, you drive past two miles of colorfully lighted floats, showcasing everything from traditional whimsical toy soldiers to spaceships and dinosaurs, all covered almost solidly with twinkling lights. Opens Thanksgiving night, November 22, 2018, and runs nightly through December 31. The Way of Lights at the National Shrine of Our Lady of the Snows in Belleville, Illinois, focuses on the biblical story of Christmas. Drive through a mile and a half of life-size biblical statues and electro-art displays that include over a million lights. The trail takes you on a scriptural Journey to Bethlehem. Open nightly from 5 p.m. to 9 p.m. Friday, November 16, through Tuesday, January 1, 2019, except closed Thanksgiving, Christmas Eve, Christmas, and New Year’s Day. There is plenty of time during the holiday season to enjoy more than one of the holiday lights displays. Why not take a weekend off of shopping and make a getaway weekend of it? Please check the individual web sites for display hours and admission fees. The lights at the Lincoln Park Zoo have been on my list for a while! 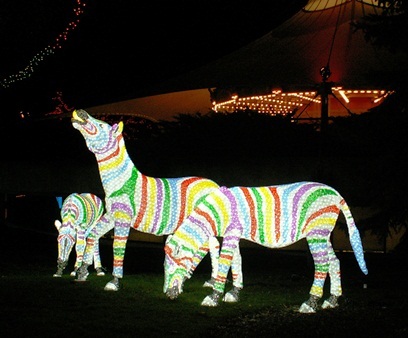 The Lincoln Park Zoolights was on my list for a long time, too. We finally got there a few years ago. Well worth going! Those are some amazing light displays! I love Christmas lights, and if I ever can get a little more north during the holidays, I will check some of these out. So beautiful! The holiday season is such a short window of time if you want to travel to see lights in other places. Looks awesome. My daughter is obsessed with everything lights and I am planning to take her here 2 weeks before Christmas when we will be touring the US. I didn’t know Illinois even had tourist attractions – and to be honest – this takes the pie. Thanks for bringing this to my attention. You’re welcome, Rene! You’ll be surprised at what you’ll find in Illinois and all over the Midwest. I’ve lived in Illinois my entire life, and I’m continually amazed at the attractions, both natural and man-made, that I discover. The Morton Arboretum’s Illumination display looks fabulous! I want to do something similar at my own home. That would be cool. I wouldn’t be surprised if companies start marketing things like that for decorating homes.